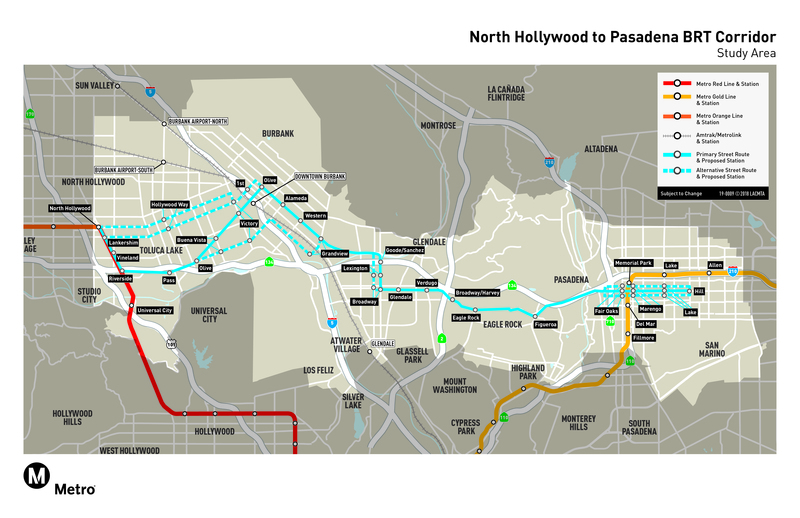 The formal planning and environmental study for the North Hollywood-to-Pasadena Bus Rapid Transit project is underway and Metro is holding a round of community meetings beginning later this month. The purpose of the meetings — dates and times are below — is to provide an update on the project and gather public feedback. Below are the two primary concepts that were identified during a prior Technical Study completed last year. One concept follows surface streets (the top map). One is similar to the current NoHo to Pasadena Express Bus (501 line) and runs mostly on the freeway (bottom map). Click to see larger versions of the maps. Eastern Segment (Eagle Rock to Pasadena): One additional variation proposes a couplet that services the area via Green and Union Streets. The Primary Freeway Concept proposes a BRT alignment that operates primarily along the 134 freeway HOV lanes as well as some surface streets for approximately 17 miles and includes nine BRT stations. The Hollywood Burbank Airport variation is similar to the Primary Freeway Concept and could begin at the North Hollywood Red/Orange Line Station and travel north to the Hollywood Burbank Airport, then enter onto the 5 freeway before merging onto the 134 at the 5/134 interchange. This variation includes 12 stations. The goal is to complete the planning and environmental study by fall 2020 and finish the project between Fiscal Years 2022-24. The project is funded by the Measure M sales tax along with funds from Senate Bill 1 gas tax and vehicle fees. For questions or to share your feedback, call us at 213.418.3228 or via email at nohopasbrt@metro.net. This is not a new concept. Way back in the 1950’s the Hollywood Freeway was built with bus stops at Western Ave., Vermont Ave. and Alvarado St. There were also stops on the San Bernadino Freeway well pass El Monte. Heck, those stops are still there actually, so I have to agree. The primary surface street route looks pretty good. It would finally give folks a faster way to get to burbank promenade mall without driving. I could personally still use it as it wouldn’t take too much longer to get to Glendale where I work, and the proposed stops/stations would be right next to my job on broadway and brand. Though taking a lane away from a heavily traveled street such as brand with diagonal parking stalls on several blocks will be a tough sell for the city of Glendale. I do feel bad for anyone going to Warner Brothers, NBC, or Disney studios, as this route would miss them entirely. However, the freeway route is basically the current 501 route but with BRT upgrades. Out of the two I do like the surface street one better. This line should be built to LRT standards so that trains along the orange line (when that becomes LRT) can simply continue on this route as well as gold line trains from the east. Keep it simple. No forced transfers to continue east or west. Metro needs to start thinking with networks rather than each individual segment resulting in the fragmented transit network we have now. Seriously. This is basically a “no build” line. It is sticking to existing roads. Right that’s part of the problem. Metro has little interest in the 134 corridor actually being a part of the main rapid transit grid long term. So, you want them to wait dozens of years to spend over a billion dollars to build something. Instead they are trying to deliver a service in less than a year for effectively loose change. Think about all of those people that won’t be served until then. Metro should have more Freeway busses on many routes. This will supply a stop gap. No reason to wait, but this line need not preclude a future LRT line somewhere along this corridor either way. Who says we can’t have both? 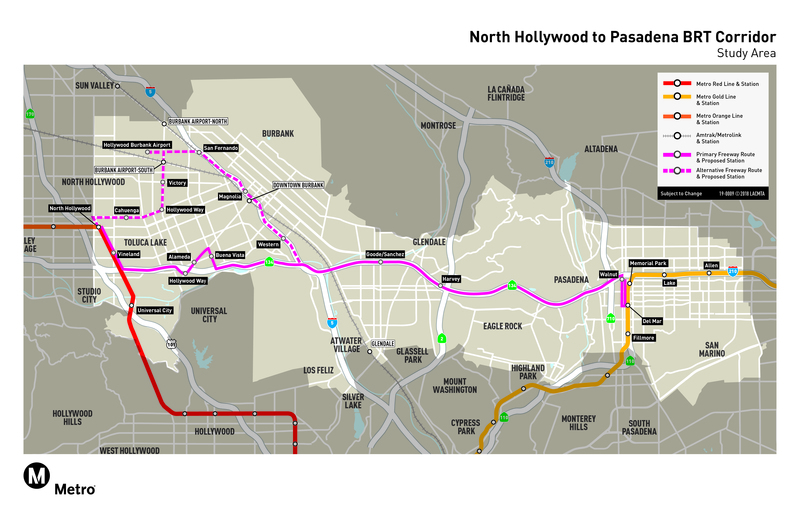 The BRT can continue via Nordhoff BRT and the Orange Line LRT can continue via the Chandler ROW until Downtown Burbank and then proceed underground to Pasadena or even Downtown LA. . . or both. Plus it could directly tie in to an LRT line running under Brand or Central blvds in Glendale which would run south to DTLA, serving Silver Lake / Echo park along the way. I tend to agree. Leaving a few stops so that you can transfer between one another would be smart. This route doesn’t have an easy one-size-fits-all route. I would also like to see a map that studies population density M-F so that the stops are both appropriately placed but also easy for bus travel. For instance, I can’t imagine Goode/Sanchez being as useful as Brand or Central.